Audrey McLeod oversees the pastry program at chef Marco Canora’s acclaimed Hearth restaurant and Zadie’s Oyster Room, offering a dessert lineup rooted in house-milled grains, natural sugars and locally sourced produce that reflects the restaurant’s embrace of whole, nutrient-dense foods. 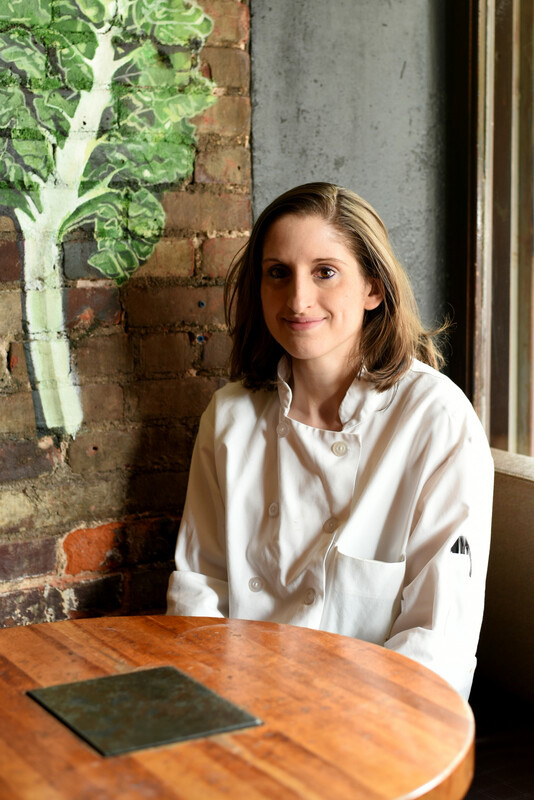 Before joining Hearth in spring 2018, McLeod graduated from the Culinary Institute of America and worked as a pastry cook and eventually sous chef in a number of New York City restaurants, including Salvation Burger, Quality Italian and Quality Meats. Under her direction, the pastry menu at Hearth offers desserts such as old-fashioned donuts, peach shortcake made with a corn biscuit and basil meringue, and a two-bite s’mores that layers house-made graham cracker with smoked marshmallow and 100% cacao fruition chocolate. We are in awe of Audrey’s creative and wholesome desserts, so we had her answer a few of our baking-related questions and share a recipe featuring Bob’s Red Mill products, so we can replicate it at home. I remember making flan (a caramel custard) for the first time when I was around 7 or 8 years old. It was my favorite dessert at the time and I found a recipe for it in one of my dad’s cookbooks. I was so determined to make it on my own and I wouldn’t let anyone help me. My first attempt actually came out really nice and I was so proud of it that I started making it all the time for everyone I knew. One time I spent almost a whole day making flan for my entire class at my elementary school. I love making doughnuts for people. It’s so satisfying to see how excited someone gets when they eat a really incredible doughnut. It makes me happy when my food makes other people happy! What is your favorite thing about your work at Hearth? My favorite thing is that I’m milling my own flour. We have a mill at Hearth, which is something that I’ve never had the opportunity to work with elsewhere. We purchase whole grains from local farms through the Union Square Greenmarket and then mill them in small batches as needed. The freshness and the quality of house-milled local flour is truly unbeatable and I think it’s a really unique thing that we are doing at Hearth. I like baking with parsnips when they are in season. They are a root vegetable that often gets overlooked when it comes to baking, but they have such a great natural sweetness so they work really well in desserts. I usually start by roasting them until they are caramelized to really bring out their flavor. I’ve worked with so many that I like, but one that comes to mind is whole grain sorghum. I enjoy popping it and seasoning it so it’s sort of like a miniature version of popcorn. This streusel was one component of a gluten-free dessert for Hearth’s spring menu. 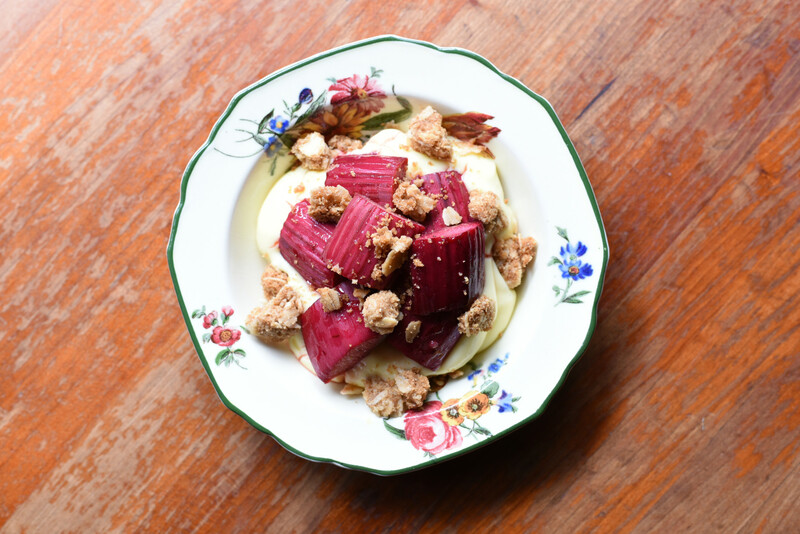 Audrey served it scattered over rhubarb roasted with honey and vanilla with a dollop of creamy vanilla custard. With the classic flavors of almonds and brown sugar, this streusel is totally versatile and can elevate any dish with an ice cream, yogurt, or custard base. 1. Toss dry ingredients in a bowl to combine. 2. Add the butter and work in by hand until evenly distributed. The streusel will be crumbly but should hold together when pressed. 3. Break up the streusel into small clusters and spread on a sheet pan. 4. Bake at 325°F until golden brown, about 10-15 minutes.